I’ve started a painting this week in my ‘classic’ watercolour style! By that I suppose I mean that the painting is carefully composed, with a preliminary pencil sketch (not shown here) to work out tonal values, composition and atmosphere. 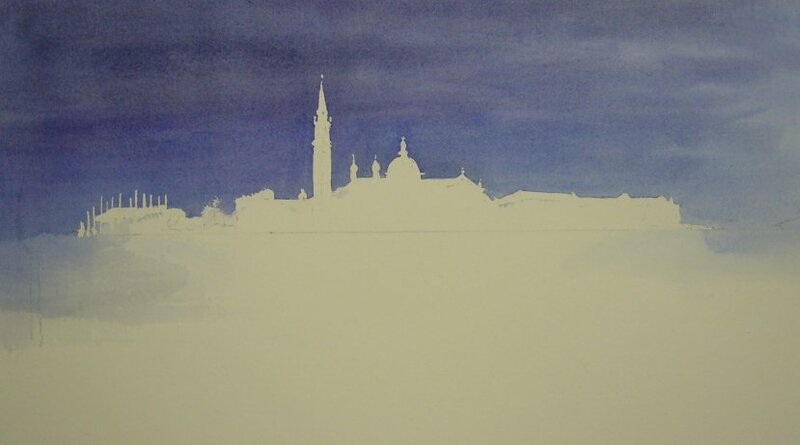 I love this view; of the island of San Giorgio Maggiore in Venice and have drawn and painted it before several times. But now I wanted to do something different, and it occurred to me that if I darkened the sky to have the buildings lighter than the sky, I could get feeling of strong late sunlight at the end of the day. I rarely use masking fluid, but here it comes into its own. By masking off the outline of the buildings, one can do more than several strong washes of colour in the sky, with no dabbling about, and the buildings will really stand out in front, as they would in a bold flash of sunlight. I didn’t do any preliminary drawing apart from the silhouette before painting the sky, just in case it all went pear-shaped and I had to start again! That’s from bitter experience! This time I was OK, and as you can see in the right hand picture, whilst waiting for washes of colour to dry, I have drawn in the gondolas in the foreground, painting one in first to work out what I liked, before committing myself to the rest. I’m looking forward to continuing tomorrow; its not in the bag just yet.